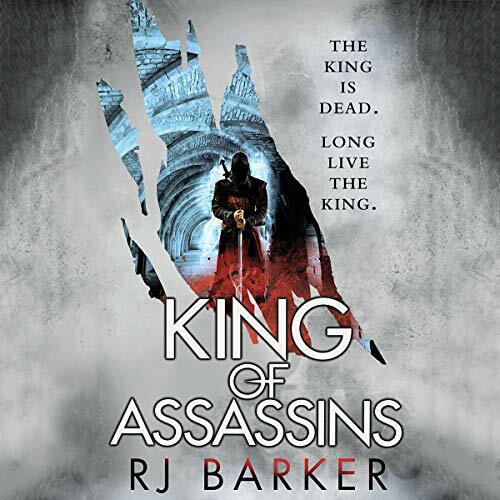 Thanks to Hachette Audio and Libro.fm for an ALC of ‘King of Assassins (The Wounded Kingdom #3)’ in exchange for an honest review. Receiving this ALC in no way influences my thoughts or opinions on the novel, author, or narrator. The Wounded Kingdom is, to date, one of the BEST fantasy trilogies I have ever read. Girton Club-Foot is, hands-down, one of my favorite characters of all-time and will forever hold a place in my heart. RJ Barker has absolutely earned his place on my ‘must-read’ list for years to come. Oh, and Joe Jameson killed it AGAIN, per his norm. Fifteen (15) years have passed since the conclusion of Blood of Assassins (The Wounded Kingdom #2). Maniydoc continues to live peacefully under King Rufra ap Vthyr’s reign, even with the Forgetting Plague sweeping across the rest of the kingdoms and thinning out their populations at an extraordinary rate, which seemed to just pass them by without so much as a sneeze from one of its civilians. The High-King’s throne now sits vacant and several look to set themselves upon it, whether that simply means by vote or through the use of blades. King Rufra takes his court to the capital in the hopes that he will one day reign, though there are many obstacles set in his path that will hinder his progress. Fortunately for him, Girton is by his side, but even he has his own demons to exorcise and gods to please. The only thing I am disappointed about with KoA is the fact that it concludes this trilogy. The capital is an evil place, full of enemies to not only Rufra, but to Girton as well for many know of his talents. Another assassin lurks in the background of the main plot, creating constant havoc and turmoil, and pointing all fingers at Girton. But he makes the best of his bad situation, or at least attempts to. He does receive assistance from some of the unlikeliest of places, which makes for a consistently puzzling adventure. It is the mystery that surrounds this entire novel that makes it so intriguing, though it does have some very grimdark moments and intense fight scenes. The characters of the Wounded Kingdom are truly what shine in these novels. Girton and his master have one of the greatest relationships I have ever seen in fantasy; one of great care, compassion, and grace. I also loved that the author gave us a glimpse into Merela’s past, culminating in such a heart-wrenching ending that I had to pause the audiobook and ball up into the fetal position. Barker has written a sensational finale to his first series as an author and I simply can’t commend him enough. At this point last year, I thought to put Age of Assassins to the side in order to get on to something else. Now, I can’t believe I didn’t read it sooner. It’s funny how we judge books before we give them chances, only to be completely enamored by what is written. If you haven’t given this series a chance, you are missing out on something truly special. That is so great to hear, Brian! I’m glad I could help out. Please let me know what you think when you get around to them!